How powerful electric motors started and what function of starters in this process? What are Direct-on-line and Star-delta? June 22, 2017, 9:01 p.m. When the stator windings of an induction motor are connected directly to its 3-phase supply, a very large current (5-8 times full load current) flows initially. This surge current reduces as the motor accelerates up to its running speed. Induction motors can be Direct-on-Line (DOL) started in this way. The starting current will not cause damage to the motor unless the motor is repeatedly started and stopped in a short space of time. This is called ‘fast cycling’. When very large motors are started direct-on-line they cause a disturbance of voltage (voltage dip) on the supply lines due to the large starting current surge. This voltage disturbance may result in the malfunction of other electrical equipment connected to the supply. To limit the starting current some large induction motors are started at reduced voltage and then have the full supply voltage reconnected when they have run up to near rated speed. Direct-on-line starting is the method most commonly used, the most usual consideration being whether the generator and the distribution system can withstand the starting current without excessive voltage dips. In the case of loads involving considerable inertia, such as centrifugal oil separators, the starting time may also be a factor. The starting current may be five to eight times the full load current, and the heating of the windings is proportional to the square of the current. At starting it will therefore be 25-64 times normal. Furthermore, at the instant of start there is no windage and no radiation. Therefore a very long starting period may result in overheating. For these reasons it is also undesirable to make repeated successive starts without intervening periods for cooling. The contactor coil is connected in series with a start button, stop button and overload trip contacts. This is called the control circuit and is energized from two lines of the 3-phase supply – usually via a step-down transformer. When the start button is pressed the control supply is connected to the contactor coil. The contactor closes and then starts the motor. When the start button is released its contacts spring open. An auxiliary contact on the contactor keeps the contactor coil energized after the start button is released. Pressing the stop button breaks the control circuit to the contactor coil; the contactor trips and the motor stops. If the motor takes too much current because it is mechanically overloaded or stalled, the overload coils will either magnetically or thermally open the overload trip contacts which will stop the motor and prevent overheating. Note, the correct term is ‘overcurrent’ rather than the commonly used ‘overload’. Reduced voltage starting is used for large motors driving loads like cargo pumps and bow thrusters. Two methods of reduced voltage starting are star-delta starting and autotransformer starting. After DOL starting, the next most common method is the Star-delta method. Both ends of each phase of the motor starter windings must be brought out and connected to starter. In the start position the windings are connected in star; in the running position they are reconnected in delta. The voltage across each phase winding in the start position is 58% of line voltage, with consequent reduction of starting current. The starting torque is also reduced to one-third of that which would obtain with d.o.l. starting. With a single-cage or double-cage rotor of average performance, this represent about 80% of full-load torque, assuming normal line voltage, but if there is appreciable line drop the torque will be proportionately lower. These factors must be taken into account when deciding whether star-delta starting is acceptable for the driven machine. It will be acceptable for centrifugal fans and pumps if, in the latter case, the friction at starting is not excessive. An automatic changeover is preferable and this is achieved by using contactors. 1) Operator closes motor isolator IS then presses start button. 2) Start button connects the supply to contactor coil S.
3) Contactor contacts S close and auxiliary contacts S1 close. 4) L close, motor windings are star connected to 3-phase supply, motor starts. 5) Auxiliary contacts L1 close at the same time as contactor contacts L. The operator may now release the start button since supply to L is maintained through L1. After a time interval which allows the motor to run up to speed, auxiliary contacts L2 and L3 close. 6) Contactor coil S is de-energised and its contacts S open; so do the auxiliary contact S1. Contactor coil D is energised and the motor is now delta connected to the 3-phase supply. In some cases a mechanical interlock is fitted between the contactor contact S and D so that both cannot be closed at the same time. The auto-transformer starter is more expensive than two type so far described and is generally used only for the larger types of motor. It is suitable for motors in which each end of the three phases is not brought out, and which would therefore be unsuitable for star-delta starting. The starting conditions depend on the position of the tapping on the transformer winding, i.e. on the secondary voltage. Usually three or more tappings are provided so that there is a choice of starting conditions such as 40, 60 or 75% of line voltage. The starting torques on these different tappings can be estimated as they are proportional to the square of the voltage. On the 60% tapping the torque will b approximately the same as with star-delta starting, and on the 40 and 75% tapping it will be proportionately lower and higher respectively. Starting large motors with long-run up periods demands a very high current surge from the supply generator. This causes a severe voltage dip which affects every load on the system. Reduced voltage starting will limit the starting surge current. One way to reduce the initial voltage supplied to the motor is to step it down using a transformer. Then, when the motor has accelerated up to almost full speed, the reduced voltage is replaced by the full mains voltage. The transformer used in this starter is not the usual type with separate primary and secondary windings. It is an autotransformer which uses only one winding for both input and output. This arrangement is cheaper, smaller and lighter than an equivalent double-wound transformer. For induction motor starting, the autotransformer is a 3-phase unit, and because of expense, this method is only used with large motor drives, e.g. electric cargo pumps. The autotransformer with its range of tapping points gives a set range of starting voltages to limit the motor starting surge current to a reasonable value. As with the star-delta starter, the autotransformer may use what is called an open transition switching sequence or a closed transition switching sequence between the start and run conditions. In the former, the reduced voltage is rapidly reconnected to the motor. 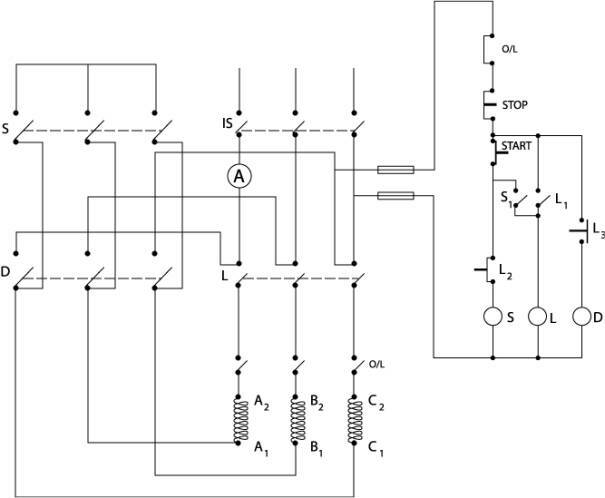 The circuit diagram below shows a manually operated open transition, autotransformer starter. The problem with open transition is that a very large surge current can flow after the transition from reduced to full voltage. An arrangement which overcomes the transition switching problem is the closed transition ‘Korndorfer’ starting method. A typical circuit is shown below. When the start button is pressed the first stage contactor coil is energised which closed the main 1st contacts and also 1st/1 and 1st/2. The timer relay coil and the second stage contactor coil are also energised. The main 2st contacts close, which applies a reduced voltage from the autotransformer to the motor windings. The motor starts. 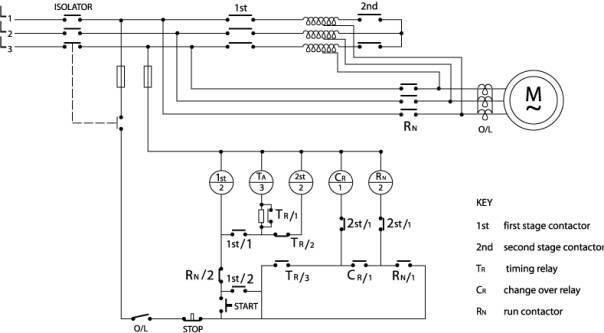 After a preset time interval the times relay opens tr/2 which drops out the second stage contactor. The star point of the transformer is opened by 2st so that transformer action no longer takes place. The transformer winding no just acts as an inductive voltage dropping impedance in the supply lines to the motor. The voltage applied to the motor is now higher than before but is still less than the full supply voltage. After a further time interval the timer relay closes tr/3, which energises the changeover relay. The changeover relay closes the run contactor which puts full voltage on to the motor. Auxiliary contacts rn/2 and rc/1 on this contactor drop out the first stage contactor and maintain the supply to the run contactor coil, respectively. The stop button or overcurrent relay trips out the run contactor to stop the motor. The windings of the autotransformer are short-time rated and the starting period must not be unduly prolonged. The rating for ‘ordinary’ during is usually suitable for not more than two starts per hour. After two consecutive starts a minimum subsequent cooling period of 60 minutes is necessary. If more frequency starting is required, starters rated for intermittent duty (40 starts per hour) should be specified. Electronic starters often referred to as ‘soft start’, are finding acceptance in the marine industry. Solid-state technology is employed to provide a method of starting without the current and torque surges mentioned previously. Thyristors or a combination of thyristors and diodes are used to control the current flow during motor starting. 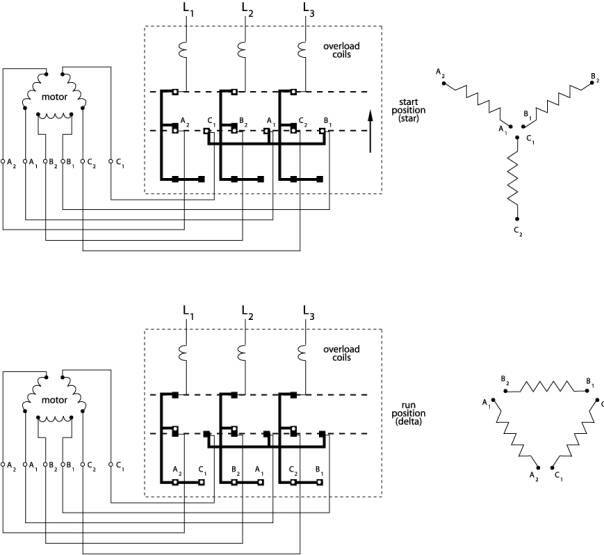 The basic circuit diagrams for these two alternatives are shown below. The electronics for controlling the firing of the thyristors is normally accommodated on a small printed circuit board within the motor controller. Although the thyristor/diode configuration is cheaper it has the disadvantage that it generates third and even harmonic currents in the motor windings, whereas the all-thyristor arrangement restricts the even harmonics. 1) Voltage ramp - This sets the time for the starter to achieve full voltage output. It should be noted that the ramp time is the time taken for the output voltage to reach its maximum and not for the motor to reach its full speed. If a motor is lightly loaded it may well achieve full speed before full voltage is applied. 2) Current limit - This adjustment is used to prevent the starting current exceeding a preset value. Because torque is proportional to the square of the current it must be set sufficiently high that adequate torque is developed to accelerate the load from rest. 3) Initial firing angle - It is often important that a drive should start as soon as voltage is applied, e.g. if the drive is standby to a duty unit. If the initial firing angel is set too small there will be a delay in starting the drive until the voltage has been ramped to a value permitting sufficient torque to be developed to accelerate it from the rest. If the initial firing angle is set too large the load may be suddenly grabbed rather than accelerated smoothly. Triacs can also be used for electronic starters. However, since they have relatively low current ratings and breakdown voltages they are generally suitable only for low-current low-voltage applications. June 22, 2017, 9:21 p.m.